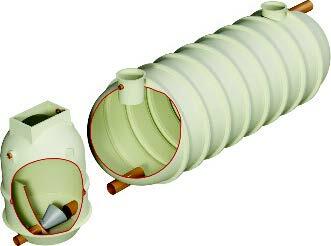 These GRP preformed tanks are made off site ready for installation in a concrete surround. As well as Attenuation Tanks, Rainwater Harvesting Tanks can be used as part of a SUDS solution, see the Water Recycling section in our Commercial, Public & Industrial Buildings Specifier. In-line systems are designed to allow water to back up through the tank, and drain by gravity through the separate GRP chamber, housing a vortex flow regulator, or within the balancing tank itself. Based on pressure, with flow being regulated through holes (varying sizes) in an orifice plate. 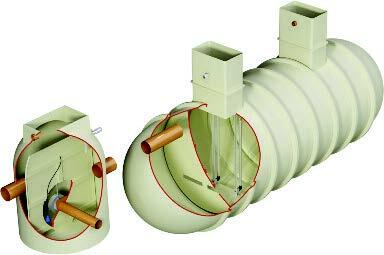 Based on creating a rotating flow around an opening at high speed to limit outflow. Works in a similar way to a bath: a vortex reduces the flow even though there is water drain. Off-line attenuation tanks have a flow regulator in a separate chamber, and so allows water to build up and even overspill into storage tanks to cope with even the worst of situations. The storage tank is emptied using in-built pumps which are automatically activated after a storm has passed. 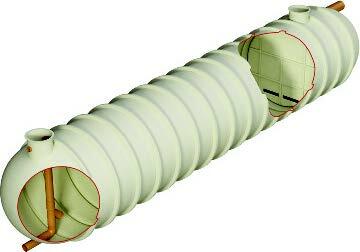 System provides a shallow inlet to outlet ratio and so can withstand larger flows of stormwater.